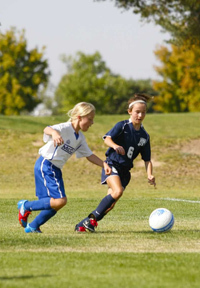 The 15th fall competitive season for the youth soccer traveling teams of the Sawtooth United Football Club debuted Sept. 29-30 with games in Boise. SUFC is sponsoring four travel teams for 60 young players ages 9-12 this fall. They are Girls’ U-12 coached by Carolina Stevens, Girls’ U-11 coached by Liv Jensen, Boys’ U-12 coached by Trent Stumph and Boys’ U-11 coached by Sally Gerlach. Weekly practices started in August and each team is playing four weekends in Boise against a large pool of Idaho teams. The season is capped by the Gem State tournament Saturday and Sunday, Oct. 13-14. Wood River Community YMCA will stage a Fun Sprint Triathlon Saturday, Oct. 13 starting with a 750-meter swim at 7 a.m. in the Ketchum pool. The 20-kilometer (12.5-mile) bicycle ride and 5k (3.1-mile) run will follow the swim, finishing at the Y along Warm Springs Road. Competitors will be grouped as individuals or on teams of two or three people. Registration closes today, Wednesday, Oct. 10. There is no race day sign-up. Entry is $35 for individuals or $55 teams. After, there is a participant barbecue on the pool patio. To register, call 727-9622 or email tri@woodriverymca.org. Visit woodriverymca.org for detailed race information. Recreational ice hockey players are invited to register from Oct. 10-28 at Sturtevants in Ketchum and Hailey for the 2012-13 Sun Valley B/B+ Hockey League. League fees will be $245 for the season, commissioner Gary Norbom said. First games of the season are scheduled for Sunday, Nov. 11 with the Sunday games continuing through April 2013 at Sun Valley Skating Center. · Maggie Sturdevant made a hole-in-one Wednesday, Oct. 3 on the Red Tees of The Valley Club’s North Nine No. 7 hole, using a 9-iron. Witness was Robin Leavitt. · Lou Ann Terry aced The Valley Club North Nine No. 4 hole on Saturday, Oct. 6, using a 7-iron from 107 yards. Witness was Sean Terry. Blaine County Gun Club in Ohio Gulch between Ketchum and Hailey is the site of a “Black Guns and the Blue Line” benefit for injured police officer Corey Weatherly on Saturday, Oct. 20. The shooting competition ($75 for 2-member teams) will begin at 3:30 p.m. Plans call for a Texas Hold ‘Em, silent auction and Top Shot Contest. Dinner is $25 per person. Weatherly is a Blaine County Sheriff’s deputy seriously injured in July 2012 when a man fell on him from a roof in Ketchum. Weatherly suffered a broken neck, nerve and tissue damage and is battling his way back to duty. The benefit will help Corey with medical bills and daily expenses through his recovery process. Tickets are available online at http://bit.ly/rxvvun, or at Tamarack Sports and The Golden Elk. Also, visit facebook.com/IdahoWBTB. Sun Valley Youth Hockey officially begins its 2012-13 season on Monday, Oct. 29, but the month of October includes a busy list of pre-season activities for the organization. The “Give Hockey a Try,” clinic for ages 5-8 is today, Wednesday from 5:30-6:30 p.m. at Sun Valley Skating Center. Kids can learn to skate at no charge. Rental skates and loaner gear are available. The scholarship deadline is Wednesday, Oct. 17 and the $75 trial hockey period ends Nov. 29. For more details or to register online visit svyha.com or call SVYH administrator Jennifer Embree at 720-3644. · Saturday, Oct. 13: Hockey swap and loaner gear from 12-2 p.m. in the Atkinson Park Recreation Room, Ketchum. Drop your gear from 11 a.m. to 12 noon, and pick up any unsold gear from 2-2:30 p.m.
· Monday and Tuesday, Oct. 22-23: Mandatory ImPACT concussion testing Oct. 22 at 3:45 p.m. at Hailey’s Wood River Middle School, and Oct. 23 at 3:45 p.m. at Wood River High School, also in Hailey. The testing is mandatory every two years for all PeeWee age skaters (11-12) and older. All new PeeWee age skaters need to be tested. · Tuesday through Thursday, Oct. 23-25: Sun Valley Suns youth hockey camp at Sun Valley Skating Center. Ages 4-8 for $30 per child from 5-6 p.m., and ages 9-13 for $50 per child from 6:10-7:30 p.m. Contact Charles Friedman at svsuns@gmail.com to sign up. · Monday and Tuesday, Oct. 29-30: Mandatory ImPACT concussion testing at 5:30 p.m. and 6:30 p.m. each day at Hemingway Elementary School in Ketchum. · Saturday and Sunday, Nov. 3-4: Coaching clinics from 9 a.m.-5 p.m. each day at the rink, for Level 1 on Nov. 3 and for Level 3 on Nov. 4. Register at www.usahockey.com.